It was the soothsayer’s warning to Julius Caesar. “Beware the Ides of March!” And sure enough, Caesar was stabbed to death in the Theatre of Pompey on that day. March 15th, 44 B.C. The Ides of March. But what do we know about The Ides of April? April 15th — that fateful day in the middle of this month! Okay, to be accurate, I know April 15th isn’t really “the Ides of April”. Ides comes from a Latin word that means “the middle”, so it seems as if it should be. But the Ides is on the 15th only in the months of March, May, July and October. So for now, apart from the fact that April 15th isn’t really “the Ides of April” — that TODAY is technically the Ides of April — it still makes an interesting conversation. Beware the ides of April, 1865! April 15th is the day President Lincoln died, after being shot in Ford’s Theater on the evening of the 14th. Recently I was reading “Manhunt: The 12-Day Chase for Lincoln’s Killer” at the same time my friend Jennifer was reading “Killing Lincoln”. We had fun comparing and discussing the two books. Beware the ides Ides of April, 1912! Probably by now everyone in the world knows that April 15th marks the hundred year anniversary of the sinking of the “unsinkable” Titanic. But that doesn’t seem to have fazed my niece, Erin. She’s getting on board a cruise ship today – Friday the 13th– and she’s very excited to be at sea on April 15th. 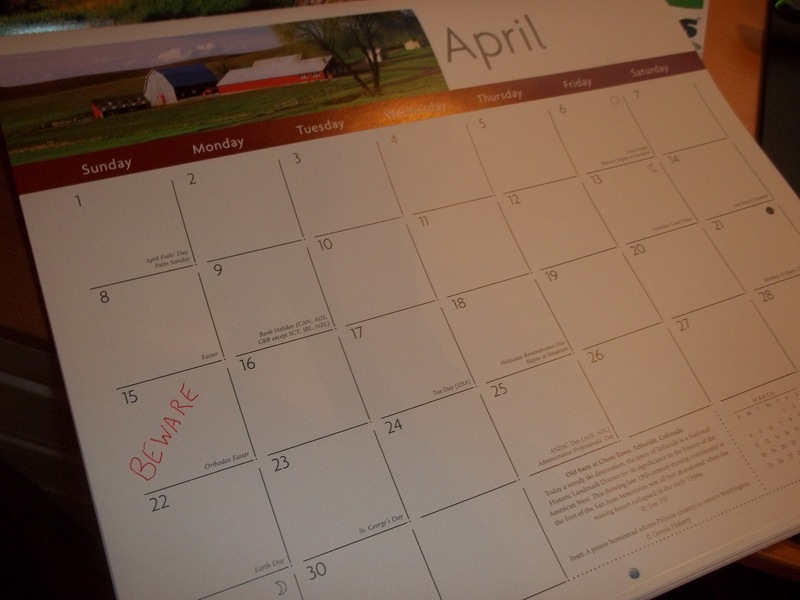 And finally…Beware the Ides of April 2012. The taxman cometh. April 15th is the deadline for filing Federal income tax returns. Now for the good news! April 15th is my son, David’s, birthday. As a toddler. David heard so many comments about this, that by the time he was two years old, he was proudly telling everybody that his birthday was on Tax Day. And so, today, on the true “Ides of April”…IDE like to say bon voyage to Erin as she sets out on her cruise, and Happy Birthday to David! Happy birthday, David! From the Olsons in Garden Valley, CA. Ide like to say I really like your puns.